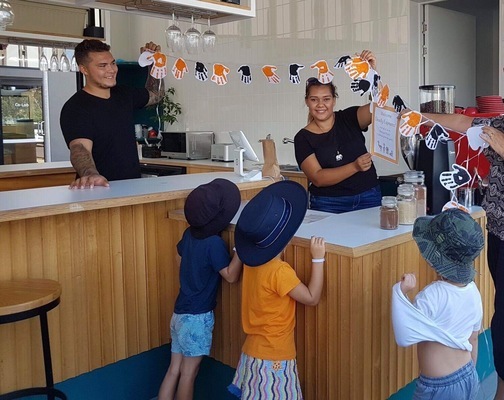 The kids from the Peregian Beach Community Kindy at the new Deadly Expresso Coffee kiosk. The Peregian Beach Community Kindy kids recently celebrated Australia’s cultural diversity during Harmony Week. In keeping with the spirit, the children concentrated on acknowledging the Gubbi Gubbi people, traditional owners of the lands where Peregian Beach Community Kindy now stands. The children, parents, grandparents and friends were delighted to go outside the Kindy grounds and up the street to visit the new Deadly Espresso Coffee kiosk, a social enterprise powered by SevGen Indigenous Corporation, an NFP organisation that, amongst other things, assists people to secure meaningful employment on the Sunshine Coast. The adults enjoyed the coffee made by Shauna (lead barista) and Kyle (support barista), and the children participated in singing, dancing, an obstacle course, ochre painting, cultural stories and tasty treats. The Peregian Beach Community Kindy hopes this is the beginning of a new relationship between the Kindy and Deadly Espresso at the Peregian Digital Hub and with the SevGen organisation.